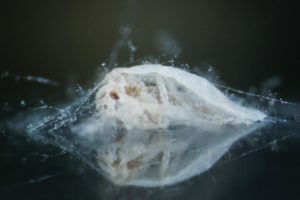 This summer, the floriculture industry has been faced with a dangerous new development — the detection of the Q-Biotype whitefly (Bemisia tabaci) in outdoor landscapes. It’s the first time that the Q-Biotype has been found in the U.S., outside of a greenhouse or wholesale nursery, since the pest was first detected on an ornamental plant in an Arizona greenhouse in December 2004. This year in Florida, there have been 47 detections of the Q since April, in retail nurseries and residential landscapes in 10 counties in Florida, from Miami-Dade to Duval County, primarily on hibiscus. Other hosts involved are crossandra, eggplant transplants, lantana, ficus, and porter weed. The detections have been in 17 retail nurseries, eight wholesale nurseries, 10 residential landscapes, and two agricultural fields. Other states have reported Q-Biotype detections this year, as well. 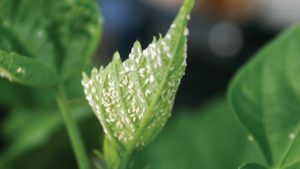 The discovery of Q-Biotype whitefly in the landscape is troubling for the entire ornamentals industry, as well as the vegetable and cotton industries, considering that the pest is an invasive that feeds on 600 crops and carries more than 100 viruses. Research on the Q-Biotype has also revealed that it is highly prone to developing resistance to insect growth regulators and other pesticides, that it maintains that resistance and doesn’t revert to susceptibility when pesticides are absent, and that it may be a better vector of pathogens than the B-Biotype whitefly. However, due to the industry’s involvement in the National Whitefly Taskforce, which since its establishment in 2005 has developed a strong framework for control and management of Q-Biotype and B-Biotype whiteflies, the outlook for mitigating the whitefly problem is positive, though it’s still a problem. 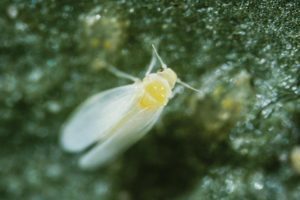 “The introduction of the Q-Biotype whitefly has threatened to be a major crisis, but thanks to industry, government, and top entomologists’ cooperation, we have been able to deal with it,” says Dr. Joe Bischoff on behalf of the Society of American Florists (SAF). 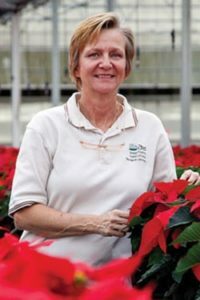 Initially detected at a retail nursery in Arizona in 2004, the Q-Biotype whitefly was found in 19 states in 2005, followed by two states in 2006 and 2007, and single-state detections in 2008 and 2010, according to Cindy McKenzie, Research Entomologist, USDA’s Agricultural Research Service (USDA-ARS). To date, Q-Biotype has been found in 26 states, with no new detections in additional states since 2010, though new samples continue to be submitted. 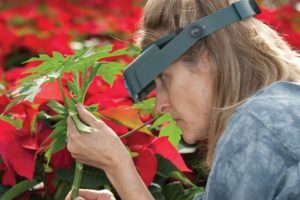 When the first Q-Biotype was traced back to poinsettias, the vegetable and cotton industries got involved, demanding that the USDA shut down imports of all poinsettia cuttings from offshore farms and limit the movement of ornamentals between states. As a result of these discussions, in 2005, the USDA’s APHIS established an Ad Hoc National Whitefly Taskforce and technical working group to decide the best response and develop a coordinated response to the problem. “APHIS determined that rather than taking a regulatory approach, an integrated pest management program should be used to control Q-biotypes,” says Dr. Mary Palm, Director of Pest Management, USDA APHIS. The cross-functional taskforce is comprised of federal and state regulators, and university and industry representatives from the floriculture, nursery, cotton, and vegetable industries. “The technical working group pulled together scientific and technical information to inform the task force, including virus transmission, distribution, susceptibility, and resistance issues, to determine chemical resistance and an appropriate treatment regime, since Q is resistant to many of the world’s pesticides and B may be developing resistance, as well,” Palm says. Together, the taskforce developed a functional plan to empower ornamental growers, so the Q-biotype would be managed by the industry through an integrated pest management program (IPM), to include sanitation, scouting, biotype identification, exclusion, educating workers, inspecting incoming plant material, etc. “Because of the work of the National Whitefly Taskforce, and the vigilance of our growers in following the recommended spray protocols, the Q-Biotype has not become a serious problem here, as it has in the Mediterranean regions,” McKenzie says. Based on the detection of Q-Biotype whitefly in the landscape, as well as increased whitefly pressure overall, Palm says APHIS is reinvigorating the cross-functional taskforce to collaborate on refocused outreach to growers and an updated IPM program. Through SAF’s role in working with USDA-ARS on the Floriculture and Nursery Research Initiative (FNRI), funding from FNRI has provided research grants to the National Whitefly Taskforce for the past decade. Through the 2014 Farm Bill’s Section 10-007 Plant Pest and Disease Management and Disaster Prevention Program, APHIS has invested $787,769 over the last three years for research programs to enhance mitigation techniques for control of several exotic whitefly species at Florida Department of Agriculture and Consumer Services and UF-IFAS, according to Kenneth Bloem, Farm Bill Management Team, Plant Protection and Quarantine Science and Technology, USDA APHIS. In addition, Bloem says APHIS has had a cooperative agreement for the last two years with UF-IFAS ($110,000 in Farm Bill Section 10-007 funds) for the Neonic Stewardship Program for the Management of the Invasive Bemisia Whitefly Complex. One major outcome of the investments by FNRI and APHIS is McKenzie’s development of molecular diagnostic tools for distinguishing different biotypes of Bemisia tabaci, and using these to more quickly determine the whitefly’s distribution. These new primers allow national and international labs to determine biotype status without the cost, time, and equipment required to sequence primer products, according to McKenzie. Prior to her work, biotyping could cost $100 per whitefly and took up to two weeks for identification. Now, growers can send whiteflies to McKenzie’s lab to be biotyped for free, and get results within a week. The tools also help researchers identify best management strategies. Further, the use of the molecular tools allows investigators to track the origins of whitefly biotypes, allowing offshore farms to improve management efforts, McKenzie says. Her research team was the first to report Q-Biotype whitefly in Guatemala, a distribution source for ornamental cuttings. A significant challenge to the floriculture industry has been the rapid shift away from neonicotinoid pesticides, in large part due to mandates from retailers responding to consumer pressure and social media campaigns suggesting a potential impact on pollinators. The challenge has been particularly felt in attempts to deal with Q-Biotype whitefly, because neonicotinoids have been an important element in the whitefly management protocol. Whitefly adult infected by a fungal pathogen, courtesy of Dr. Lance Osborne, University of Florida IFAS. These new challenges require additional research dollars, to allow the taskforce to develop whitefly management programs that are not totally dependent on the use of at-risk pesticides like neonicotinoids. The taskforce recently applied for third-year funding from the USDA’s 10-007 program for continued work in this area. 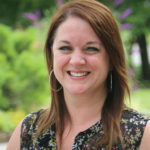 Currently, Osborne and McKenzie and their teams are evaluating three new chemistries — Rycar, Mainspring, and Xxpire, as well as pesticide rotations with and without neonicotinoids, and multiple unregistered materials. “We have no silver bullets, but I feel we have the ability to manage this pest by using a systems approach, and stringing a number of control tactics together in an overall management plan,” Osborne says. This approach incorporates new chemistries that are compatible with certain biological control agents showing efficacy on Q-Biotype whitefly, including three beetles, two wasps, one predatory thrips and two mites. What could actually harm the battle against Q-Biotype whitefly, the taskforce agrees, is for states to make it a regulated, actionable pest and quarantine greenhouse operations until no Q-Biotype whiteflies are found in the crops, as growers will then use all means to try to obtain 100% whitefly-free plant material, irrespective of the species or biotype. Going forward, APHIS recommends that growers mitigate Q-Biotype whitefly with IPM practices, including scouting, exclusion, sanitation, isolating and inspecting young plants, and using the appropriate controls. Follow the Q-Biotype whitefly management recommendations at http://goo.gl/E5w4mC. Communication with other growers, customers, and scientists is crucial, to understand the problems at hand, what controls are working and what is not. This is especially important during high-pressure production times like poinsettia season. The USDA’s Animal and Plant Health Inspection Service (APHIS) is partnering with the floriculture and nursery industry to develop an offshore cuttings greenhouse certification program. The voluntary program will ensure that participating producers are following specific facility requirements and growing standards that address plant pests and pathogens, according to Andrea Simao, Director of Preclearance and Offshore Programs, USDA-APHIS. APHIS and the industry hope to pilot this program in fiscal year 2017. “APHIS works collaboratively with many industries domestically and abroad to develop operationally practical solutions that mitigate against quarantine pests entering the U.S. via various plant import pathways,” Simao says. Currently, APHIS is working with the major offshore ornamental cutting producers to develop production and sanitation standards for implementation offshore that control a range of pests, including insect pests and plant pathogens. 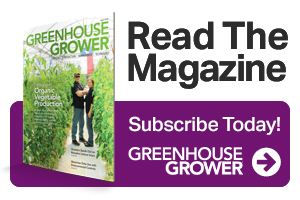 Look for additional details on the certification program soon, on GreenhouseGrower.com.